A really intriguing exploration of the theme. Thanks for it. I’ve seen many poles like this, but not until your photo did I connect it to the African nail figures where nails driven into the figure represents the taking of an oath, the witnessing of an agreement, each nail increasing the power of the figure. I’ll always see them that way now, thank you. There’s a tree along the one-lane road coming up the hollow where I live — the largest black birch on the mountain, and the closest tree to the road. One has to be careful when driving past it not to catch the mirror. Anyway, one day three years ago I noticed that its bark was stippled with maybe 25 very rusty nail heads. I’d just been reading about those African figures you mention, so it gave me a very funny feeling! Given its distance from the house, though, I think it probably used to bear No Trespassing or Safety Zone (for hunting) signs. It’s a fascinating image, but now I am really intrigued. African nail figures? Google “Nail fetish figures.” I personally find the term “fetish” out-dated and patronizing, and would prefer culturally neutral terms like icon or amulet, but the art world is slow to change (and ever since the early modernists, has celebrated the supposed “primitivism” of African art — a bigoted and nonsensical way to think of art). The most terrible appearance is attributed to the nail figures. In anthropological literature they are generally known as Konde or Nkonde. Laman’s Dictionary of 1936 notes Khonde which designates in the Yombe dialect an Nkisi, and Nkondi which means a hunter who leaves to hunt in secret, and an Nkisi provoking a sickness in the chest, an Nkisi detecting a thief, or finally, a large statue in wood. The last meaning corresponds to Van Wing’s interpretation of Nkondi as being among the Mpangu, either a large or small Nkisi figure. On the other hand, J. H. Weeks, who lived in Sao Salvador and with the Zombo and other Eastern Bakongo, mentioned the nail figures called Mbanzangola which belonged only to the magician and never to a private person. 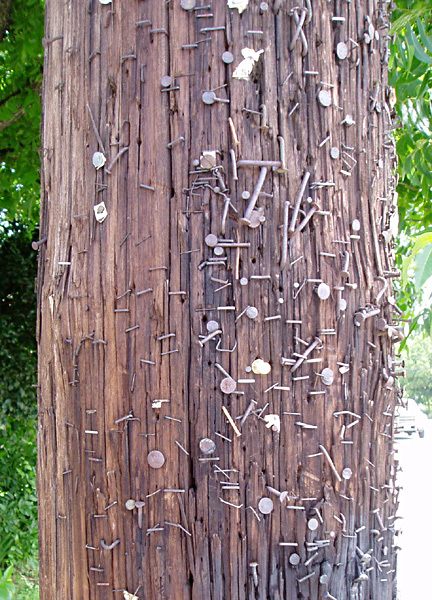 According to most records, the nail sculpture operates in a destructive way. Sometimes, however it is mentioned as a healing fetish. A. Maesen designates its role as ambivalent. The meaning of knife-stabs or of nails driven into the vital parts also seems to be somewhat ambiguous; there is an interpretation viewing them as offerings for benefits received. A nail may also be driven into the image by a sick person to pass on his complaint to an enemy, who, he thinks, sent it to him. The destructive and horrible impression of Nkondi figures results from their specific paraphernalia such as nails and other attributes, and from their partial polychromy, rather than from the carved statuettes themselves. Even the “menacing” gesture is often replaced by the gesture of the medicinal figures. Such is the case, for instance, of the large, almost life-size sculpture from the Linden-Museum, Stuttgart, and of other nail figures published by Jiirgen Zwernemann. Sometimes, the gesture of the figure becomes irrelevant, being hidden by the paraphernalia. I was fascinated with the responses about African nail fetish figures, which indeed drove me to google the phrase. For me the pictured pole signified our compulsion to communicate, especially about events involving various forms of art distantly related to Nkonde (art shows, musical events, garage sales, etc.). It pleased me to see accidental art grow out of these other creative moments.